Be sure to refer back to the link above to see the before and after. I lightly sanded all the legs, just enough to scuff up the surface so paint will stick. On the top I used paint/stain stripper to remove all the existing stain. The brand I used was Old Master's Paint Remover (it is what I had on hand). Please note that using stripper is messy and dangerous, you must wear gloves and you need plenty of newspaper or plastic under any piece you are working on to prevent the stain remover from getting on other surfaces. After stripping the table top, I used my my electric sander to remove any remaining stain and to smooth the wood a bit. 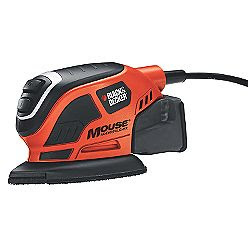 I have a mouse sander from Black and Decker, I love this tool it makes sanding ten times easier on flat surfaces and I've had it for 10 plus years and it still works great. After sanding I wiped down the whole table to remove any dust left over from sanding. I then covered the table top with plastic and taped all the edges down under the edge of the table. Once I had the top protected I began painting the legs. I spray painted the legs with Kilz Primer (in a spray can), I needed two cans for this project. Once the primer was dry (about an hour) I painted all the legs white. I used Valspar Satin paint, the color is Behr, Swiss Coffee. To apply the paint I used my Wagner Paint Sprayer, this is my favorite tool. 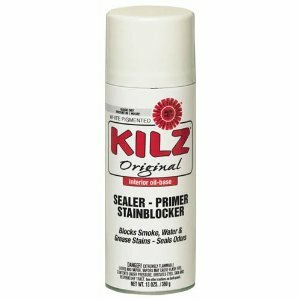 It is so easy to use and clean and it applies a thick coat of paint. It worked so well on this project that I only needed one coat of paint. After painting I applied the stain to the table top using a lamb's wool applicator. I used Dark Walnut Oil Base stain from Ace Hardware. This is a very important step and I always want to skip when I am finished, but it is important in protecting the furniture long term. Once everything was dry and had cured about a week, I applied the final top coat to seal the whole table. 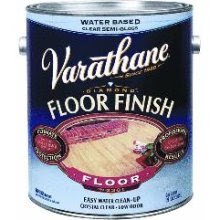 I use Varathan Floor Finisher, it leaves a crystal clear coat and does not yellow white furniture. I applied 2 coats to the legs and 5 coats to the top for added protection. This type of clear coat drys quickly and you apply multiple coats for full coverage. It drys to a glossy clear finish. Great job April - the table is very pretty and I was impressed with the smooth finish. Awesome post, thanks so much!! This helps me more than you know. I am going to follow these directions exactly. I've been thinking about getting a paint sprayer since I have several projects I'd like to complete, so I think you've talked me into it. Thanks again for the fantastic how-to. Glad it is helpful. The sprayer really is wonderful. I actually learned about it from Perfectly Imperfect blog, she has a little video tutorial on the sprayer. Just search her site for paint sprayer and it should pull up the post. It makes painting go by quick! Good evening! I'm new to your blog and I must say that I am hooked! I was wondering how the Varathane has held up over the years. Thank you! Hello, your DIY works are awesome! Thank you for sharing the tips! It is very helpful and informative. Would love to see more updates from you.